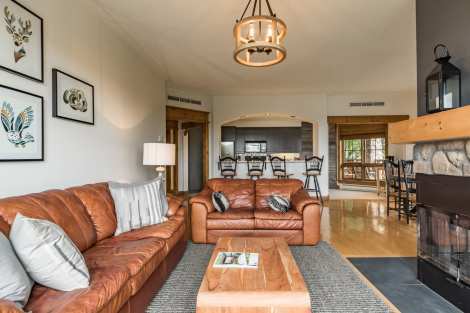 Spectacular architecture and sensational mountain scenery, tasteful woodwork, cozy fireplaces, deluxe kitchens and elegant furnishings offer you unequaled comfort. Outdoors, you will love the whirlpools with a glorious view of Lake Tremblant. These features make the Equinoxe Tremblant premium, Ski In/Ski Out luxury residences. Air-conditioning, indoor parking and a swimming pool provide a truly unique mountain vacation experience. Some units have a barbecue. You deserve the best! Property Bonus: A very large, colorful and bright unit with a panoramic view over Tremblant and the Lake.